Where do you feel the most comfortable? When you were younger, what kind of child were you? If you were at school, which of the following would most likely be your most favorite class/subject? Which of the following phrases best describes your romantic life? I am currently dissatisfied with my romantic life. Given the choice, where would you most like to live? When are you more comfortable? Which of the following do you see as one of your greatest strengths? Which of the following do you see as one of your greatest weaknesses? Which of the following qualities do you see as the most important? You are pensive and pragmatic and always think before you act. You've cultivated a great sense of self control and may often feel worried over the ramifications of your actions. The burden of responsibility lays heavily on you and there are times where you may wish you could run away from it all. Yet you are dedicated and loyal and quite capable. You possess a good deal of power as well as a strong sense of responsibility to use this power cautiously so not to hurt those who you care for. You are strong and demanding, but also caring and maternal. You expect the best from yourself and those around you. You are a leader, but one who prefers to lead by example and will do whatever you can to bring out the best in those you care for. You possess a good deal of self confidence, something that can at times be misconstrued by others as flippancy or self entitlement. You feel passionate about your values and are inclined to stand up and act for your beliefs and sense of justice. You’re a kind and gentle person. You are sensitive and attuned to the feelings of others. At the same time you can at times feel quite lonely and apart from others. Your feelings and experiences are rather unique and it can sometimes be a bit isolating. You just don’t always fit in with others and often long to find others who are more like you. All of this has helped make you into a better person, someone who is aware of and tuned into the needs and feelings of others. You always stand up to injustices and, though you may come across as reserved and perhaps even self-conscious, you will act when you see someone else being wronged. For you, life is an adventure and you just can’t wait to see it all. You’re not scared to try new things and are very open to all sort of new experiences and different places. You love to travel and meet new people. Your thrill seeking can sometimes lead to acting irresponsible and you sometimes have trouble getting things done. You get bored easily and this at times may lead to turbulence in your social and/or romantic life. At the end of the day, however, you have good values and a strong sense of right and wrong. You may have a hard time staying in one place or keeping your head out of the clouds, but you are good to the people in your life and will always stick up for those who are being wronged. Talking and planning is for weaker souls, for you life is about action! You wear your heart on your sleeve and you're not shy to let other people know how you feel and what your attitudes are. Sitting back and watching is just not something you can do, you need to jump in and be involved. And you quite enjoy the more physical things in life: good food, good drink, good company. You can be the life of the party. And yet all this can sometimes lead to impulsive behaviors as well as getting into a bit of trouble. So be it. It’s who you are and who you’re meant to be; and if some people don’t like it then they can take a hike. When all is said and done, your good heart and strong sense of honor more than makes up for whatever collateral damage might occur along the way. 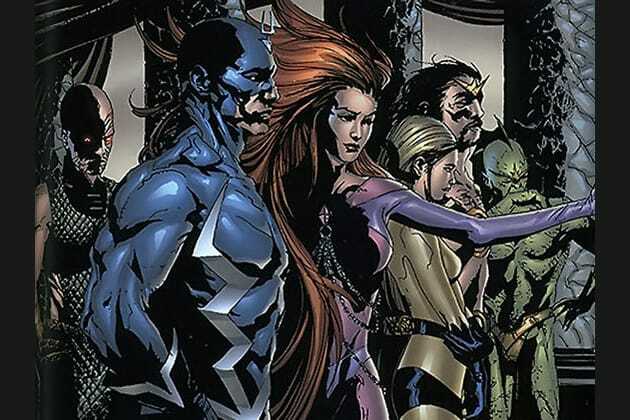 Ever wonder which member of the Inhuman Royal family best embodies your personality? Wonder no further. This quick quiz will provide the answers.